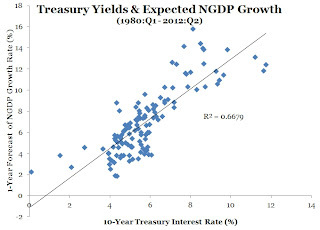 This figure shows that the expected growth rate of nominal GDP or aggregate demand is strongly related to the 10-year treasury yield. Thus, the recent rise in long-term yields can be interpreted as the bond market pricing in a rise in the expected growth of aggregate demand. And that is great news given the ongoing aggregate demand shortfall in the U.S. economy. In the past few weeks, the risk of recession in the developed economies has fallen sharply, both because of the actions of the ECB, and because of the recovery in the labour market in the US. It is true that global GDP growth has remained very subdued in 2012 Q1, at around 2 per cent in the US and zero in the eurozone, with much worse to come in the eurozone in Q2. It is also true that GDP growth in China appears to be dropping into a 7-8 per cent range, which is well below normal. But the market is now disposed to view these sluggish GDP figures as temporary, and not the harbinger of future recession. This has led to what might be termed a “healthy” sell off in government bond markets, in which rising growth expectations have reduced the probability which the market attaches to further QE from the central banks. Equity prices have risen to reflect this. Credit spreads have narrowed for the same reason. The rise in government yields, while belated, is a natural counter-part to these shifts in other markets. Another way of saying this is that the long-term natural rate of interest, the long-term interest rate consistent with underlying economic fundamentals, is starting to rise. This is an important point because it undermines the claim made by folks like Bill Gross that the Fed is harming savers and investors keeping interest rates low. While it is true that the Fed's large scale asset purchases (LSAPs) over the past few years probably have lowered the risk premium on long-term yields, this effect has been shown to be small compared to the 300 basis points plus drop in the 10-year treasury interest rate since 2007. What really was driving down long-term yields was a weakened global economy. Now that there are signs that it is improving, savers and investors should begin to earn higher real returns. So much for the financial repression view. Had it been better understood by the public that causality runs from improved economic outlook to higher interest rates, and not the other way around, then maybe there would have been more willingness by Fed officials to do to fully restore aggregate demand. I hope this lesson gets learned and it is not repeated. Update: Lars Christensen reaches the same conclusion using the equation of exchange. I believe if you look at Argentina over the past 50+ years you will find a nice correlation between interest rates and nominal gdp growth. Oh dear, so much to learn, so little time to do it. Rising interest rates would provide more income to savers. Zero percent interest rates are not healthy for an ecnomony. They cause economic distortions that impede the best allocation of capital. 10-year treasuries are, like a cheap wine, an inferior good. 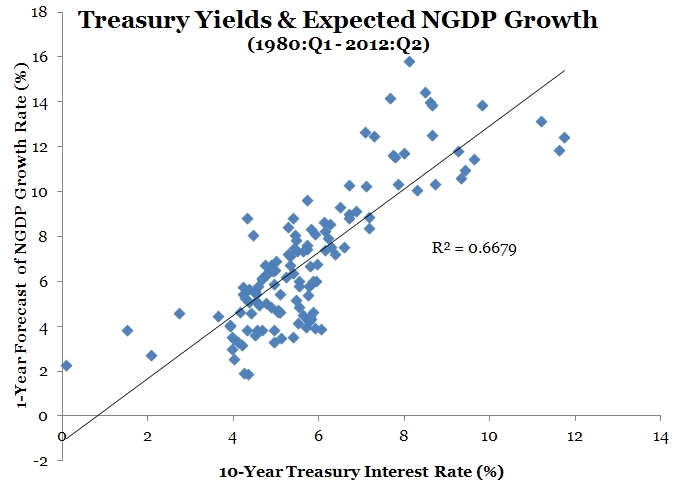 When aggregate nominal income falls, demand for 10-year treasuries rises. I believe that you may be confusing real yields with inflation expectations. Yes, but raising interest rates also makes it more expensive to service debt. That reduces the amount of income to the "mythical" saver. Which is why "ZIRP" is worse for debtors than savers in a trap. Nothing moves. Literally. Sure, raising interest rates makes it more expensive to service, but incomes have also gone up providing an offset.